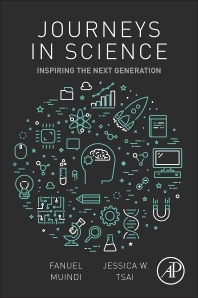 Journeys in Science: Inspiring the Next Generation examines the STEM education pipeline and discusses important strategies on working through the various challenges that STEM trainees face. The book takes a look at career possibilities for scientists in the broadest sense, and is not solely limited to academia. Coverage includes individual and local concepts, as well as a discussion on how STEM education impacts trainee communities across the globe. The book also focuses on diversity in STEM and offers valuable insights based on the authors’ own experiences. Fanuel Muindi, PhD, grew up in Tanzania and completed his undergraduate degree at Morehouse College and his PhD in Biology at Stanford University, where he was awarded a DARE Fellowship. He completed his post-doctoral fellowship at the Massachusetts Institute of Technology and is now Assistant Director of Graduate Programs, Department of Molecular and Cellular Biology, at Harvard University. He is also the Director and a co-founder of STEM Education Advocacy. He has published articles in Nature, Nature Biotechnology, and Science. Jessica W. Tsai, MD, PhD, grew up in California as a second generation Asian American and completed her undergraduate degree at Stanford University and her MD and PhD in Neurosciences at the Stanford University School of Medicine, where she was awarded a Graduate Public Service Fellowship. She is now a 3rd year Pediatrics resident at Boston Children's Hospital and Boston Medical Center where she is also completing a post-doctoral fellowship at Harvard Medical School. She also serves as an advisor with the STEM Education Advocacy Group and is the editor of Perspectives in STEM Education. She has published articles in The New York Times, Science Careers, Nature Biotechnology, and Science. Awesome book! I look forward to reading more!